This year I've felt a bit wobbly in my calling. I've kept right on doing what it is I've known for sure in the past I was to give my time and energy to, but sometimes it feels as if I were to pull one little string of uncertainty, the whole structure of my life might unravel. There are some things that I know for sure: I am to be a student of Christ, an attentive wife, an engaged mother, and, of course, those meals won't cook themselves. But it's one question that nags me: Am I really doing what God wants me to do? ....like when someone tells me how God is leading them and I wonder if I should be doing that really great thing too. ....or when I am weary from the monotony of doing pretty much the same things I've been doing for 8 years and I dwell too long on, "What for?" and "What does it matter anyway?" ...or when I struggle to hear God's voice and wonder if I'm somehow missing Him. I've prayed over and over for clarity from the Lord, but He clearly has to wade through a lot to speak to me, not the least of which is my lack of my faith and my lack of confidence. 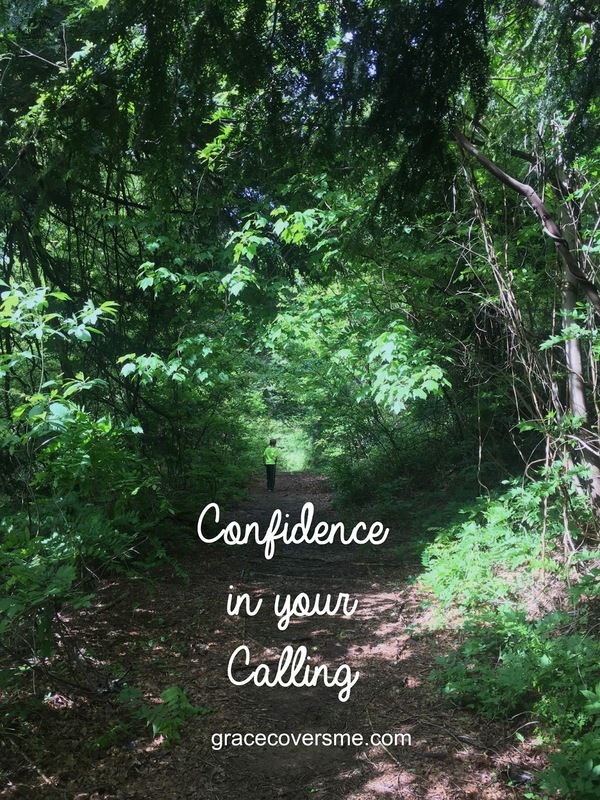 The truth is that I'm more than clear where I'm called by Him to be giving my time and energy, but my confidence is too often shaken because I look to the wrong things for confirmation of that calling. I think we all do this to some degree. We have crazy ideas of what God's calling on our life will look like or feel like, so we end up walking through life with fear and trepidation rather than boldness, looking to the wrong things for our confidence. What are the things we look to for our confidence instead of looking to the Lord? We look to others for a sense of confidence in our calling. This is so dangerous for so many reasons, but primary among them is that all of us looking each to the other creates a homogenous church. We start believing that we must fit into a mold or our calling is not valid. We have a fear of being different or misunderstood or even judged. Our fear of people is far greater than our fear of the Lord. This is not only idolatry, but it also hinder us from the joy of walking behind God's leadership. We look to our circumstances. We live by sight rather than by faith. When we don't get results right away or when people don't pat us on the back or when it gets hard or monotonous, we think we've missed how God is leading us to use our gifts. We look to those who are confident in their calling. We turn to the left and to the right and see other people boldly using their gifts and think they don't ever deal with uncertainty or setbacks or criticism. It would be easier to be them and to have their calling. As a result, we believe either God is unfair or we are inadequate for God to use us, or some combination of the two. I'm preaching to the choir here, friends. This is what I myself do. "Now thanks be to God who always leads us in triumph in Christ, and through us diffuses the fragrance of His knowledge in every place. For we are to God the fragrance of Christ among those who are being saved and and among those who are perishing...And who is sufficient for these things?" "And we have such confidence through Christ toward God. Not that we are sufficient of ourselves to think of anything as being from ourselves, but our sufficiency is from God, who also made us sufficient as ministers..."
What strikes me here is that confidence comes with knowing that God is the primary actor. God diffuses a beautiful fragrance through us as we go. God makes us sufficient for where He takes us. He makes us into bold ministers. I want so badly to please the Lord, but I don't as easily trust that He'll lead me. I tend toward believing He's more of an evaluator than a Good Shepherd. Sometimes I do trust Him but I'm looking to Him for some lifeless formula--do this, don't do that--rather than believing that following Him is more like a joyful triumphal procession or diffusing some attractive fragrance. In my mind, it's all gloom and doom if I don't get it right. In God's mind, it's already right because of Christ. I think our calling is mostly about enjoying and conveying the triumph and the beauty than it is some wacky formula. Short of rejecting Him, I can't mess that up. Talk about a confidence booster.